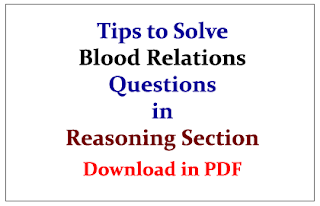 The Reasoning section of every competitive exam includes questions from the topic "Blood Relations". This topic is considered to be quiet important and every year a good number of questions are asked from this topic. It is considered to be a very scoring topic. We are providing you with all the important tools to solve blood relations questions. father-mother, son daughter, brother-sister, grandfather-grandmother, uncle-aunty, nephew-niece, brother-in-law sister-in-law etc. The list can go on and on adding members from father’s side and mother’s side etc. Family/Blood Relation Tests are an exercise to test the candidate’s ability to comprehend and come to the crux of an issue from complex, lengthy and unclear data. ‘Ram’ is the father of ‘Kusha’ but ‘Kusha’ is not his son. ‘Mala’ is the daughter of ‘Kusha’.’Shalaka’ is the spouse of ‘Ram’. ‘Gopal’ is the brother of ‘Kusha’. ‘Hari’ is the son of ‘Gopal’. ‘Meena’ is the spouse of ‘Gopal’. ‘Ganpat’ is the father of ‘Meena’. Who is the grand daughter of ‘Ram’? ‘Mala’ is the daughter of ‘Kusha’ and ‘Ram’ is the father of ‘Kusha’. So, ‘Mala’ is the granddaughter of ‘Ram’. Hence, answer is (2) Mala. Most English speakers use “uncle” for any of four relationships: father’s brother, mother’s brother, father’s sister’s husband, or mother’s sister’s husband. Again, “aunt” in English could mean father’s sister, mother’s sister, father’s brother’s wife, or mother’s brother’s wife. Brother’s or sister’s son is called nephew. Brother’s or sister’s daughter is called niece. Children of aunt or uncle are called cousins. Any relationship term ending with -in-law indicates that the relationship is by marriage and not by blood. In other words, -in-law will be a blood relative of the spouse. For example, “brothers-in-law” and not “brother-in-laws”. The only exception is the general term “in-laws”, which is always plural. Father-in-law is the father of spouse; mother-in-law is the mother of spouse. If parents get divorced and remarry, their new spouses are called stepparents, not mother-in-law and father-in-law. The husband of daughter is son-in-law; the wife of son is daughter-in-law. If spouse has children from a previous marriage, those are called stepchildren, not sons-in-law or daughters-in-law. The person is their stepfather or stepmother, not their father-in-law or mother-in-law. iii) The wife of spouse’s brother. The relationships of the second generation are prefixed with the word Grand. Similarly, for a person, the first generation above him would be that of his/her parents (Father/ Mother). The next/second generation above him/her would be the parents of the parents who would be called Grand Parents/ Grand Father/ Grand Mother of that person. The next/ third generation parents would be called Great Grand Parents/ Great Grand Father/ Great Grand Mother of that person. This also applies to the collateral relationships. 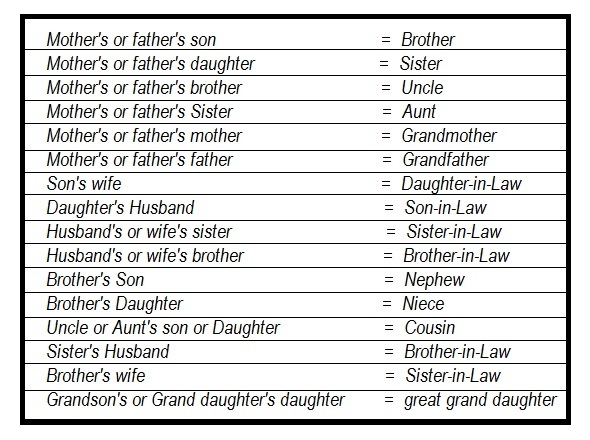 For example: Son of nephew of a person is called Grand Nephew; Brother of Grand Father is called Grand Uncle and so on. The fourth generation relationships are called Great Great Grand. For example, Son of Great Grand Son is Great Great Grand Son. a) If Martha’s mother marries second time, and her new husband (Martha’s new stepfather) already has a daughter from a previous marriage, that daughter is Martha’s stepsister because one of her parents is married to one of Martha’s parents. b) If Martha’s father marries second time, and his new wife already has a daughter, that daughter is again Martha’s stepsister.